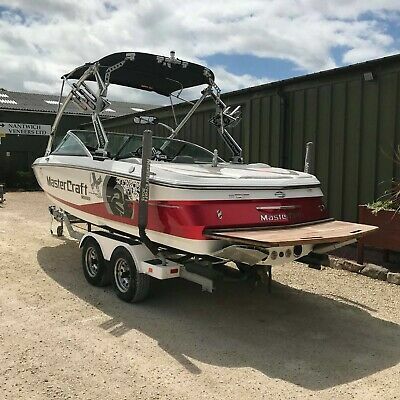 Home » Mastercraft Boats » 2010 Mastercraft X2 Wakeboard Wakesurf Waterski Boat – With Surf System! Comments Off on 2010 Mastercraft X2 Wakeboard Wakesurf Waterski Boat – With Surf System! 2010 Mastercraft X2 Wakeboard Wakesurf Waterski Boat – With Surf System! 2010 Mastercraft X2 Very high specification boat that has been in our care for servicing for several years. She is in immaculate condition and had many thousands spent on extras such as a fully automated ‘Wave Control’ wakesurf system and underwater lighting. Freshwater use only, having lived on her trailer at the shores of Lake Windermere for the vast majority of her life. Specification from Factory includes:- Bimini top- Folding wakeboard tower- Clamping board racks- Clip in carpets- Dual batteries- Heater- LCD screen at dash- Zero off cruise control- 3 tank ballast – Mastercraft UK trailer with spare wheel – Upgraded prop- MCX 350hp 5.7 V8 motor- Interior lighting package- JL Sound system with subwoofer and amplifier. The boat has masses of service history. We have known it’s ownership from new and looked after it for around 5-years to date. She has been serviced and properly maintained every year. All usual dealer facilities available including Part-exchange and finance subject to status. Please call Mike on 01270 580180 for further details.